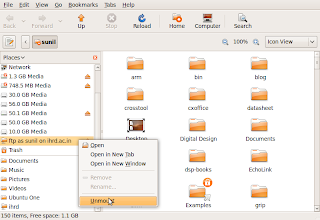 Ubuntu 9.04 desktop support accessing remote file system from the places menu. Click on Places->Connect to server . You will get the following pop up. The different possible server types are shown below. If you want to connect to a windows share , select the specific options and fill in the details. You can book mark the share with a name so that next time you can quickly connect to the share. The bookmark also appears in Nautilus. If you want to remove a bookmark , right click on it in Nautilus and unmount it. See the screen shot below. Java run time and java plug n is an essential component you need on any decent linux desktop. They are required for running applications as well as browsing java enabled web pages. Several flavours of java is available on the repository. Some of them may not have full functionality. Here's how to install Java run time and java plug in on ubuntu. Even though Java was a popular environment on many platforms, the linux distributions were not bundling it due to the restrictive licecnse . Recently, however, Sun Microsystems relaxed the restrictions on the Java license, introducing the Distro License for Java (DLJ). This new license allows distributors to ship Sun's JRE and Java Development Kit (JDK) as installable packages, rather than the self-extracting binaries that were previously available. It also gives Linux distributors the ability to define the packaging, installation, and support for Java within their Linux distribution. As such, ubuntu 9.04 Jaunty now ships with Sun's Java available as a non-free package in the multiverse repository. You'll need to have the universe and multiverse repositories enabled to install Java. On ubuntu the java is available as several components which you can use as per your requirement. Both java 5 and java 6 packages are available. Once you've got the multiverse repository enabled, installing Sun's Java package is easy. Simply open a terminal window and apt-get the package. Once apt-get downloads the packages and begins the installation, you'll get a screen that contains the Sun Operating System Distributor License for Java. Read the license, if you wish, and hit Enter to continue. You'll see a dialog that asks you if you agree with the DLJ license terms. Select Yes, and hit Enter; the JRE will finish installing. At this point, Java is installed. If you see an unexpected version of Java in particular some thing like the lines below, you may have Open JDK installed. 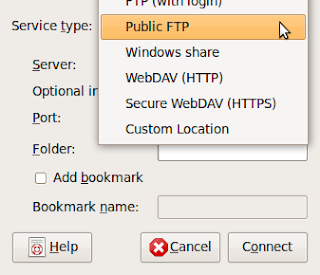 If the JRE is properly installed, confirm that the Java plug-in is installed in your browser by opening Firefox and typing about:plugins in the address bar . Look for java and verify that it is enabled. If you are planning to develop applications using java , you can install jdk as below. If you want to read long web pages and don't like to see the dirty graphics , install elinks. It is available on almost all distributions. You can enter a URL and start browsing. See the google page below. Elinks is basically a console program and can be manipulated form keyboard. ( The mouse also will work ). You can access the elinks menu by pressing escape key. See the screen shot below. The elinks browser support most of the modern web features. I enjoy browsing with elinks as it gives me extremely fast response while browsing the net. Now let us enable some more features. Press escape and enable menus. Select Setup-> terminal options. 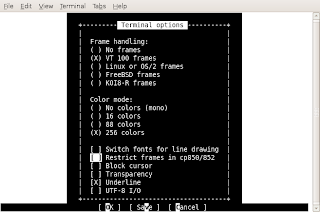 Enable Vt100 frames , 256 colors and underline. 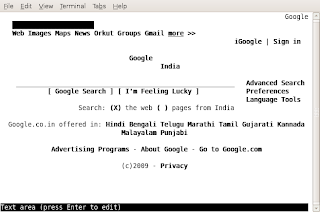 Now try gmail with elinks. You can navigate the web page with arrow keys . There are some more short cuts that you can use. Have a look at the menus. If you have access to a remote computer via ssh , it is possible to mount your home directory on the remote machine locally. You have an account on a remote machine A with IP a.a.a.a and you are working on a local machine B. You want to mount the your home directory on A to a folder on B. I am also assuming that both the machines are running Ubuntu/Debian. On machine A install open-ssh server. This will prompt you with a key finger print of A and ask you whether you want to add this key to the list of trusted machines. Accept the key. Now it will prompt for the password on the remote machine. Log out from A by typing logout. Install sshfs and fuse-utils on the local machine B. The sshfs package can mount remote directories / filesystems via fuse. (FUSE is file systems in user Space). 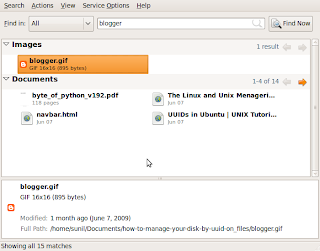 On ubuntu , you must be a member of fuse group to access FUSE. You can manually edit /etc/groups to add your user name to fuse group. Or it can be done from System->Administration->Usersand Groups on Gnome desktop ( on ubuntu). Create a directory on the local machine. Now, mount the remote directory. (There is a colon after the IP address above) . You home directoy on the remote machine A will be visible under remote_dir folder. You can unmount the remote directory with the following command. Today I had to set up dhcp server on a machine running Ubuntu 9.04. The machine was supposed to serve 10 other machine running ubuntu/windows xp. Here is the steps I followed. Then I restarted the server . The above configuration file will serve IP range from 192.168.0.20 to 192.168.0.250. If you have a different IP scheme modify the values as required. In fact , there are several other options for dhcpd which you can control. The original config file has some examples settings explained in it. If you have multiple interfaces on the machine, modify /etc/default/dhcp3-server file to specify which interface the server should run. Beagle is a free desktop search tool which is gaining popularity with several applications. You can search your desktop just as you search with google. It is possible to use beagle as a standalone search tool or integrate with applications such as firefox for easy desktop search. In fact, it is one application that any serious Linux user can not ignore. The beagle package for other distributions are also available . Look at the beagle project home page. Once installed , beagle is run as a daemon in the background. It will start indexing the following information based on the configuration. The indexing is done in real time . Files are immediately indexed when they are created, are re-indexed when they are modified, and are dropped from the index upon deletion.E-mails are indexed upon arrival. IM conversations are indexed as you chat, a line at a time. Web pages are indexed as you view them. You can use beagle in several ways. The easiest way is to use the graphical interface. Click on Accessories --> Search . You will get the following search screen. You can type the search query in the text box provided. The result are shown in the second panel. You can preview the results by clicking on the result. There are several command line options you can try. Please look at this page for more details. You can do beagle queries from the command line too. The above command will search for blog in the beagle index. There are two possibilities with firefox. b) Use firefox as client for beagle search. a) You can index the pages you browse using beagle. Download this extension. Save it to your hard disk. 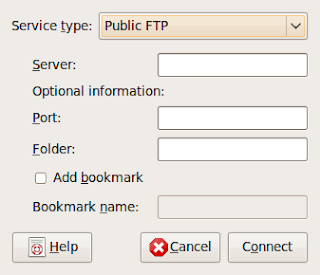 Inside firefox, click on File->open and then select the downloaded xpi file. It will prompt you to install the beagle extension. Restart firefox. A small icon will appear near the bottom corner of your browser window. You can control indexing by clicking on that button. b) Now let us configure fire fox as a client for beagle. You can add an entry like google search box to firfox and do local searches. For this enable network web interface in beagle. Open beagle gui search from accessories . Click on Search->Preferences -> network options. Check enable web interface for local search. Now click on this link. It will install beagle search for your firefox. Checkinstall is a beautiful program which lets you create your own debs or rpms. This program is available in the Ubuntu universe repository. Using it you can quickly build your own ubuntu packages from source code. You can install it on Ubuntu 9.04 as below. Now download the source package of the program you want to convert to a deb. Let us take CenterIM , a text mode IM client. Try to compile the code. Run the configure script to create makefile. If some of the required directories such as doc--pack is not available it will prompt you to create them and finally show the following screen. Checkinstall will compile and make a debian package for you. It can fail during compilation if the libraries need for compiling the program that you are trying to build is not installed. You can also create other packages for redhat or slackware based systems. The man pages of checkinstall list lot of options. Have a look at it. Most of the Linux users use pidgin as a universal instant messenger client. Popular distributions such as ubuntu will install pidgin by default. 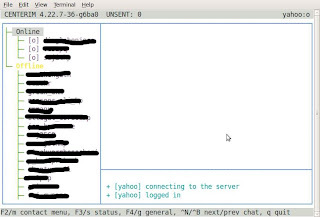 CenterIM ( aka cim) is a multi protocol text mode instant messaging client similar to pidgin. Let us see how it can be installed on ubuntu. The ubuntu universe repository has centerim available as a deb package which can be installed directly via apt. However, the version supplied with Ubuntu 9.04 is dated and if you install it yahoo protocol will not work. So download the latest centerim tarball form the home page. For me the configure step above failed initially saying that libssl is need for yahoo protocol . It was solved by installing libssl-dev. If the configure step above complains about any missing library , install the development version of the library. You may get a few such errors depending on your installation. Once CenterIM is compiled and installed you can use it for the following protocols. The interface is somewhat cryptic and needs some effort to get used too. Still, I like CenterIM as a text mode replacement for pidgin. Sufficient quantity of free disk space is an absolute necessity irrespective of the Linux distro that you run. We can find out statistics about disk usage with certain simple command line utilities. Let us explore a few of them. It prints the disk usage on u physical drives and some special directories. At the creation of a file system on a disk the number of i nodes are fixed. If you have a large number of small files you can run out of i-node. The following example list the i-node utilization. The above example lists the usage of SAS by SAS directory. You can specify multiple directories with the -c option and total them up. You can exclude files that match a certain pattern from being counted using the exclude option. See the following example which excludes iso images from being counted. 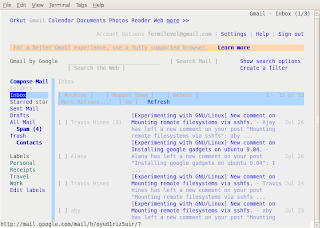 Google is a nice addition to your ubuntu 9.04 desktop. Here is how I installed it. If it asks for any dependency , install them too. Now the google gadget panel will appear on the screen. There are lot of cool gadget available. You can install them by right clicking on the gadget panel. OpenSSH provides tools to securely do remote login, remote execution, and remote file copy over network . It also supports encryption keys so that you can use it on remote machisne wiht out entering passwords repeatedly. tar can be used along with ssh so that you can create backups on/of remote machines quickly. The following examples show how this can be achieved. Create a back up directory and change to it. Use ssh and tar to copy files. Now let us try to make tgz files at the recieveing end by compressing the tar archive. I had made an earlier post on reading man pages. In this post we will look at apropos utility with which you can search the man pages of any Linux command for keywords. There is a description section associated with each man page . The apropos command searches the description section for a given keyword. Keywords can be a regular expression or wild-cards , or match the exact keyword. lppasswd (1)         - add, change, or delete digest passwords. All similar man page entries are shown. This can be very useful when you search for a particular command or man page. checkPasswdAccess (3) - query the SELinux policy database in the kernel. ecryptfs-unwrap-passphrase (1) - unwrap an eCryptfs mount passphrase from file. ecryptfs-wrap-passphrase (1) - wrap an eCryptfs mount passphrase. If you have an ubuntu/debian system , you can rebuild the deb file of any installed package. For this install the dpkg-repack package. Suppose you have aspell installed on you system . Rebuild the package as below. dpkg-repack will work only as root. information that identifies the software. The deb files can be manipulated with dpkg command. Here are some common dpkg tricks that you can use in every day life on the Ubuntu/Debian systems. Let us first get a debian package from Internet. I am using Ubuntu 9.04 for this tutorial and will be using aspell as a demo package. Download aspell from the Jaunty repository. Now Let us explore the contents of a deb package. Extract the deb to the aspell_tmp directory. You can see the package contents. The control information alone can be extrcted using -e flag instead of -x. Or you can list the contents of a deb package as below. If the package is not removed completely, you may see some configuration files left over. can be attached to files and directories that are specific to certain file system types. For example, most of the present day distributions use the ext3 file system. In ext3 we can set other attributes to files and directories. Let us have a quick look. Run the following command in a terminal. See the output . The dashes against each file directory represent the various attributes that can be set. T (top of directory hierarchy). These attributes can be manipulated with chattr command. The man pages of chattr has additional info on various attributes. Open a shell and try the following . The HISTFILE environment variable points to the name of the file where bash history is stored. When bash exits, history in memory is written back to the .bash_history file. The number of commands held in history during a bash session is set by $HISTSIZE, while the number of commands actually stored in the history file is set by $HISTFILESIZE. You can use history command to list the entire command line history. You can use up arrow and down arrow keys to move around the history buffer.Once a command is displayed, you can use the keyboard to edit the current command like any other command: left arrow, right arrow, Delete, Backspace, and so on. There are some other tricks you can use . You can type in the string to be searched after the colon and press enter. You can press Ctrl+r repeatedly to search backwards through your history list for a specific occurrence of the string. This will open command 427 in vim and you can edit it and save it back to history. RTFM fc for details. The mplayer project is one of the best movie players for both windows and linux. Mplayer is basically a console based player. 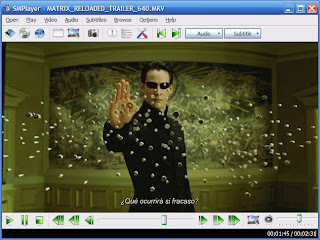 There are several projects on the internet providing GUI front ends to mplayer. smplayer is one of the best front ends that you can download. Both source and binary releases of smplayer are available on sourceforge. For installation on ubuntu 9.04 you can try the following steps. The mplayer bundled with jaunty is slightly outdated. You can update mplayer to a more recent version and install smplayer front end following the steps below. A windows version of smplayer is also available on the website. Midori is a light weight browser developed as a part of Xface desktop environment. You can download the source code of midori from here. It uses webkit rendering engine and gtk2. 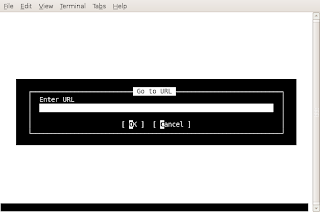 This how to will show the installation of midori on Ubuntu 9.04 . Enjoy the browser. Don't forget to report bugs as the software is under heavy development.